Regardless of whether you are pregnant or not, you should pay special attention to your stretch marks, especially if you are aged between 20 and 30. Stretch marks are a sort of scars that usually occur in the dermis. Striae distensae, as known in dermatology, are commonly caused by skin distending and sudden weight changes. According to researchers, there is a strong connection between the hormonal changes in pregnant women and teenagers and the occurrence of stretch marks. Speaking of health, stretch marks are in no way dangerous or harmful. They are more like an esthetic issue that bothers almost anyone who has them and affects self-confidence. 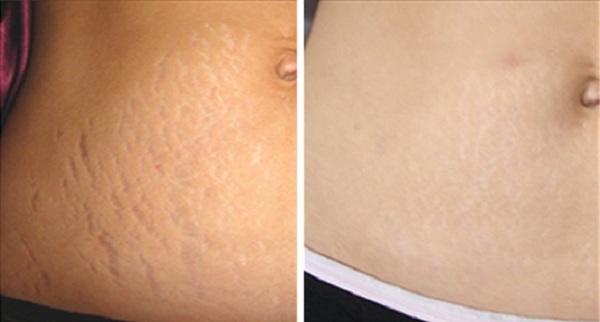 Stretch marks become more visible as their color changes. At the beginning, they occurs as dark lines that go across the stretched skin. Over time, stretch marks become lighter, and thus more visible. Stretch marks usually ‘attack’ the area where most of the fat is stored, including your abdomen, buttocks, arms, legs and breasts. The marked is flooded with chemical-laden lotions and gels that promise to diminish the unattractive stripes, but unfortunately, there is no pharmaceutical formula that can guarantee you an effective treatment. Having these white lines all across your belly can be really frustrating and stressful, so we give you some amazing all-natural remedies that will reduce the appearance of these unpleasant marks. You can apply various treatments to maintain your skin moisturized and strong, and reduce stretch marks. Apply your favorite moisturizing day cream with natural ingredients. If you already have stretch marks, make this simple cream at your home to prevent the situation from getting worse. It is an excellent choice when it comes to moisturizing skin. Combine the ingredients in a bowl and apply the cream onto the affected skin area using circular motions. Leave the cream on for at least 15 minutes, than clean the skin using cotton cloth soaked in warm water. Eggs are an excellent source of protein. They are not only healthy and delicious, but they also work great when applied topically. Eggs give hair an amazing shine, and they also aid in removing stretch marks in the initial phase of their formation. Eggs are recommended to women during their first pregnancy, because they also prevent the occurrence of stretch marks. Combine an egg yolk and some healthy vegetable oil into a thick cream. Leave it on for 15 minutes and rinse with lukewarm water. You probably know that essential oils are great for your skin. Folk remedies made from essential oils can eliminate most of your stretch marks, even if they are deep and old. Remember that you should never apply essential oils on your skin on their own, because they may cause irritations or allergies. Combine your favorite oil with olive or almond oil. You can also add some of the oil in your moisturizing cream.